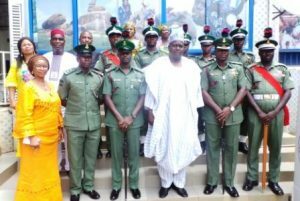 The Nigerian Army stands for unity and peace of our country which are the core elements of Nigerian culture says the Director General, National Council for Arts and Culture, Otunba Segun Runsewe. 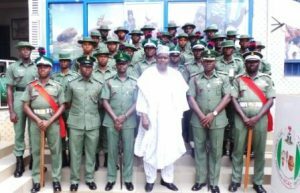 The Director General while welcoming the students and instructors of the Guards Brigade of the Nigerian Army who are on excursion to the Council headquarters, commended the Nigerian Army for the outstanding roles they have been playing to unite the nation and bring about sustainable peace and social harmony. According to Runsewe, culture is the greatest value of the people and since culture cannot thrive in an environment devoid of peace, he congratulated the Army on the efforts they are making to ensure that natural peace and sustenance of democracy are given adequate attention in the nation. Runsewe informed the officers and men of the Guards Brigade that his Council is using culture to change the negative narratives of Nigeria and he enjoined the military to continue as ambassadors of Nigeria culture wherever they find themselves. He added that his Council will join hands with the Nigerian Army to ensure that their next West African Social Activity (WASA) is taken to Maidugri in the North East of Nigeria to prove to the world that peace has returned to Nigeria especially in the North Eastern part of the country. He advised them to also appreciate other people’s culture whenever they are on foreign missions in order to avoid unnecessary tension while discharging their duties outside the country. Answering a question on how culture could contribute to the eradication of unemployment in Nigeria, Runsewe told his guests that the National Council for Arts and Council has within the last one year trained over Seven hundred and twenty (720) youths on Skill Acquisition, adding that many of them are already doing well in their chosen careers. He said the Council was doing this as part of its Corporate Social Responsibility. In responding the leader of the delegation, Major M. T Bent of the Guards Brigade Nigerian Army, appreciated the Director General for receiving them and commended the Council under Runsewe’s leadership for using culture based dramas in educating the masses to eschew various vices. Major Bent added that the excursion to the headquarters of the National Council for Arts and Culture was a home coming for the Nigerian Army as the Army was a product of the Nigerian culture. He noted that they are many areas of collaboration between the Army and the Council and called for better synergy between the Army and NCAC for the overall interest of peace, social harmony and development of Nigeria.